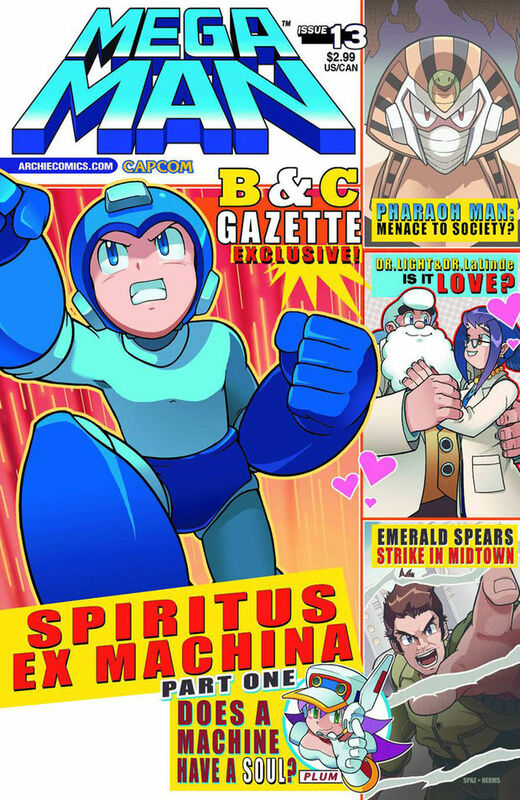 Amazon has posted a pre-order listing for the fourth trade paperback compilation of Archie's Mega Man comic book series. Chronicling the complete "Spiritus Ex Machina" story arc (issues #13 through #16), this handy book will retail for $11.99, due out on December 26, 2012. The release is certainly a long ways away, but justified given the fact the arc hasn't begun circulation yet. Amazon's product description is devoid of supplemental material. However, if tradition holds true, volume 4 will be accompanied by some sweet bonuses like exclusive sketches, cover variants and other goodies. Pre-order your copy here. In the meantime, you can pick up volume 2, on sale wherever books and comics are sold. Volume 3 is due out later this summer, August 28. I sincerely hope Archie doesn't stop these trade paperbacks. They're the only way I can read the comics where I'm from. These awesome trades leave me torn as to if I want to maintain my subscription or not. On the one hand the issues get me the story faster, but on the other the collected trades are nicer, not that much more expensive, and ad free. Though I also want to support this series. In an ideal world of infinite shelf space I'd just get both. Glad to hear they're keeping up the trade paperbacks. I'm eagerly awaiting volume 3 this August.